The products are specific to each vehicle. In order to bring you the best satisfaction for its use, we strongly advise you to have them assembled by automotive professionals. For more information visit our website. 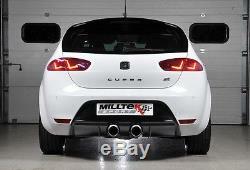 Stainless steel line after milltek catalyst for seat leon 2.0 cupra 265chvx from 2010. Diameter of tubes 76,2mm.